Only great photographs tell the real story of the world's greatest cycle race. 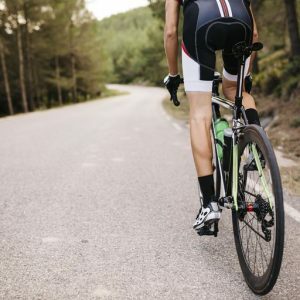 The Tour de France is the largest free sporting event in the world, watched live roadside by millions each year; the race is as much a part of French summer holidays as a picnic in the mountains or a trip to the beach. So it’s no surprise that many well-known photographers have worked in or around the Tour at some point in their careers. 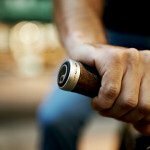 As sports go, cycling provides a photographer’s ideal scenario for reportage, social documentary, or street photography: It happens in real time, and in the public environment. And anywhere the road goes, the peloton follows. Our photographic partners from Getty Images have banks of great images, but we’ve pinned down our favourites based on the amazing moments and stories they represent. 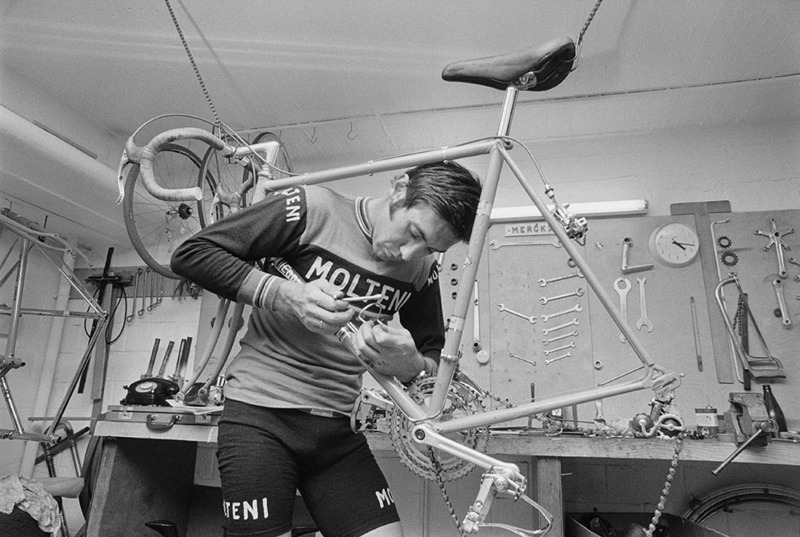 Merckx is a five-time winner of the Tour de France, and a three-time World Champion, and was obsessed with tinkering with his bike. He would spend hours adjusting saddle heights; and famously, during the 1973 World Championships, he also made saddle-height adjustments during races. One wonders what modern mechanics would have thought of Merckx’s constant fiddling. 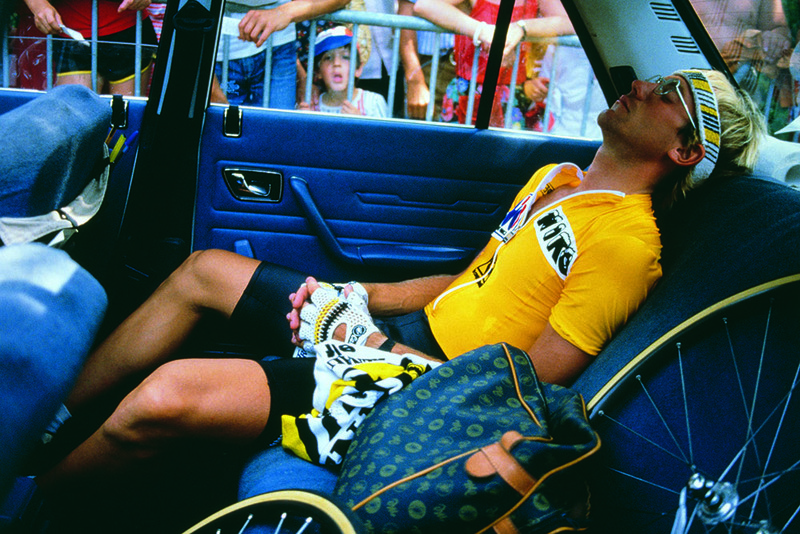 French star Laurent Fignon relaxes before the start of a dramatic final stage of the 1989 Tour de France. Fignon, the local favourite, led American Greg Lemond by 50 seconds going into the final 25km individual time trial stage. By the finish Lemond’s aero bars and superior time-trialling gave him the overall win by just eight seconds. Many regard it as the greatest Tour de France battle in history. 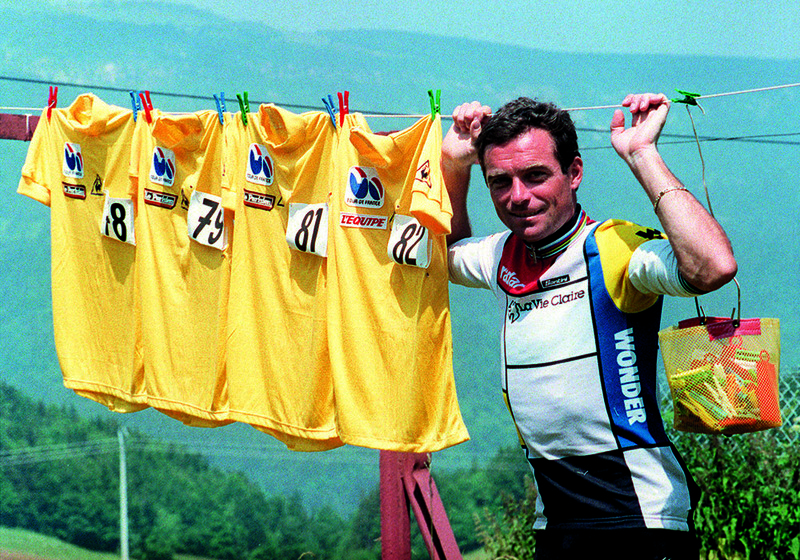 Frenchman Bernard Hinault displays his collection of yellow jerseys during a day off – on 12 July 1985 – in Villard-de-Lans, France. Hinault, nicknamed ‘The Badger’ because of his aggressive fighting spirit, is one of seven cyclists to have won every Grand Tour, including five Tours de France. Often controversial, Hinault recently suggested that Chris Froome did not belong among the cycling legends after his Giro d’Italia win, because of recent doping allegations. 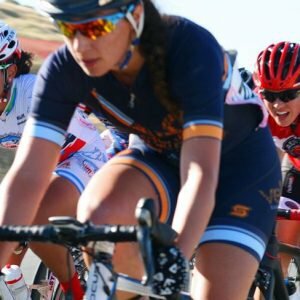 Crashing is an inevitable part of road cycling, even among the most skilled and talented pro pelotons. With speeds that reach over 55km/h on the flat roads, one errant move can bring down half the riders in seconds. Battered and bloodied they may be, but the only thing that will stop a rider continuing is a doctor’s insistence. 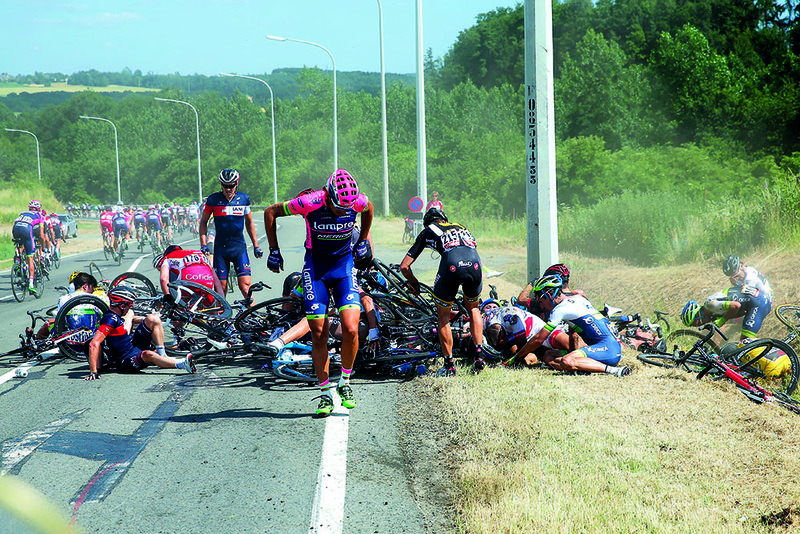 Here, riders collect themselves after a crash – with 65km left to race – in stage three of the 2015 Tour de France, from Anvers to Huy on 6 July. In the pre-professional years of the Tour de France there were no soigneurs standing by the roadside delivering drinks and food. It was a self-help service, with organisers simply leaving a truck on the side of the road with refreshments on board. It was these refreshment stops that informed the unspoken code of the pro peloton: when all riders agree to stops and breaks, no-one can attack, or they will face the ire of the bunch. In the 1960’s the Tour was gaining in popularity, but the professionalism of big teams was still in its infancy. 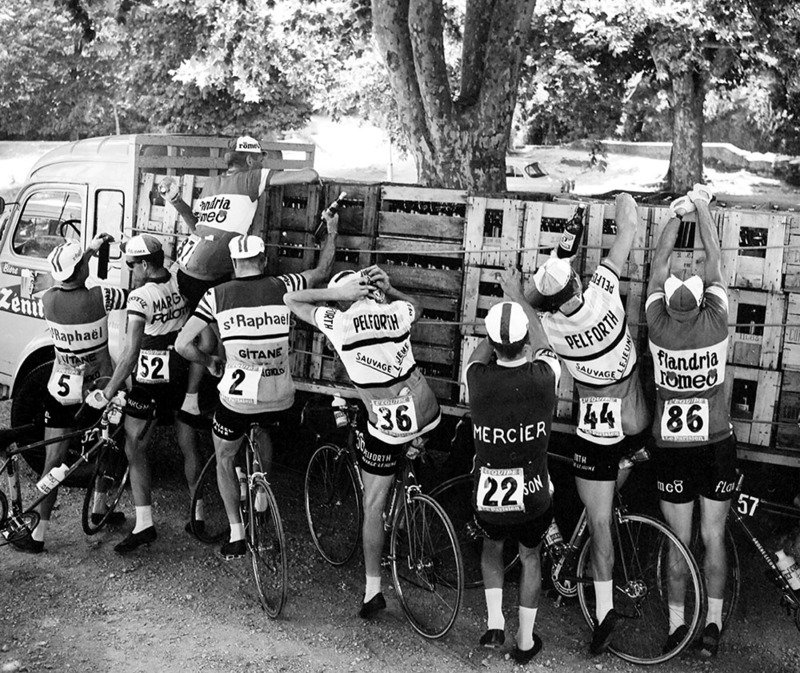 Here riders get fresh supplies during the 11th stage of the Tour, between Toulon and Montpelier, 2 July 1964. 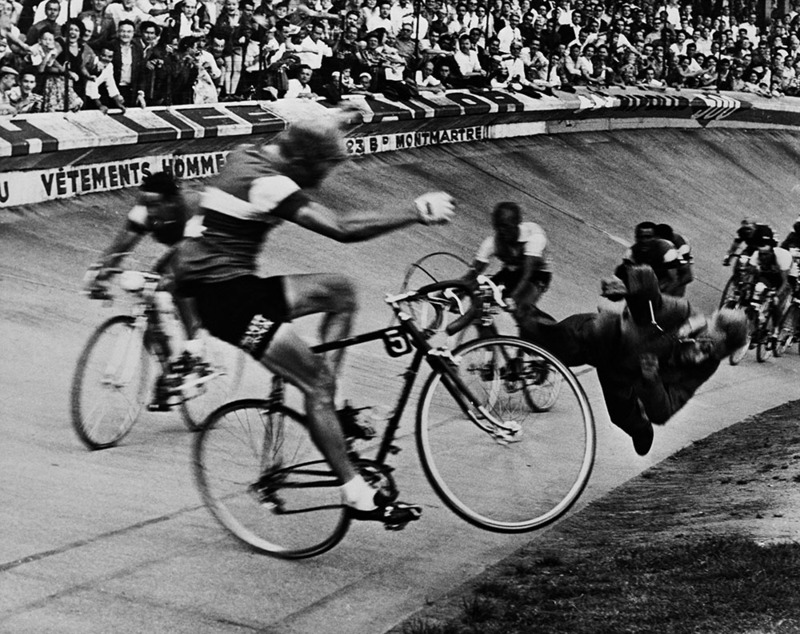 During the final stage in Paris, French rider Andre Darrigade slammed into a track official who was standing too close to the track during the final sprint, trying to keep photographers away from the riders. Darrigade needed stitches; but the 70-year-old official died of his injuries 11 days later. 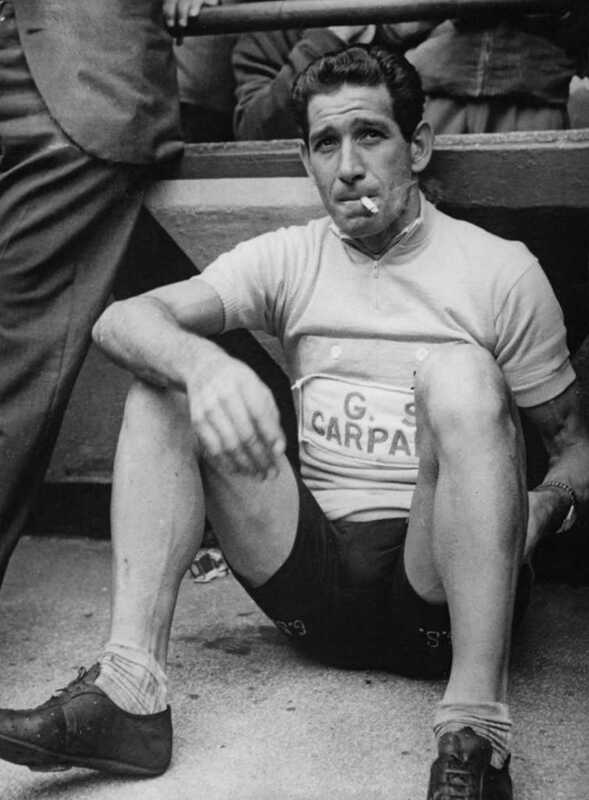 Italian racing cyclist Gastone Nencini enjoys a cigarette after his victory in the Tour on 17 July 1960; it was his first smoke in a month. The often-forgotten champion, who also won the Giro, was famous for his love of wine and women, despite the directeurs sportif who attempted to curb his wild ways.